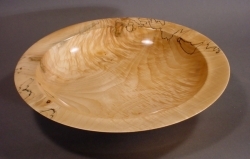 Product Description: Stunning spalted maple bowl from crotch wood. 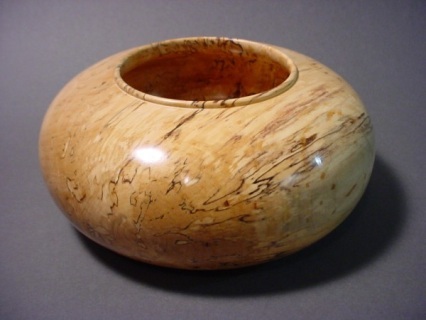 Magnificent grain and spalting. 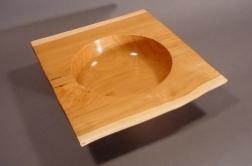 Product Description: Square, natural edge cherry bowl with bark off. Tight grain. 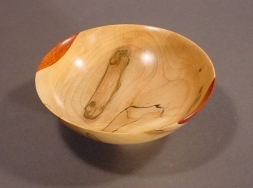 Product Description: Small spalted maple bowl with bloodwood tips. 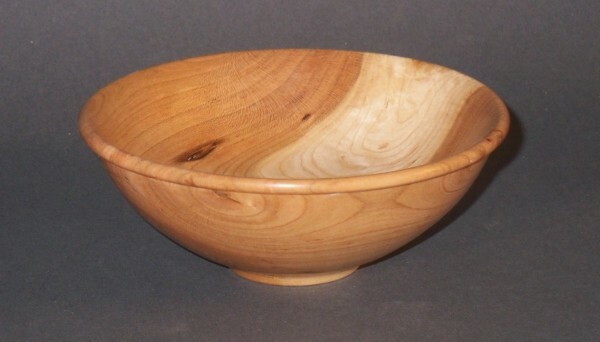 Product Description: Juniper bowl from crotch wood. Nice grain and color. 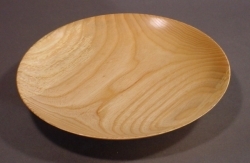 Product Description: This shallow platter style bowl is cut from mildly spalted ash. 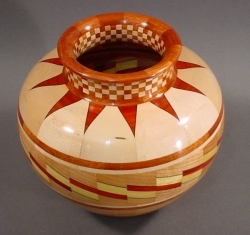 Product Description: Segmented Maple and Cherry bowl inspired by Native American pottery with feature ring of Cherry, Bloodwood, Yellowheart, and Black-Dyed Veneer. 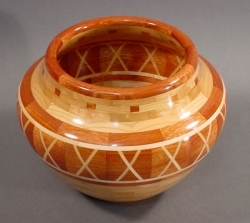 Product Description: Segmented Cherry bowl inspired by Native American pottery with feature ring of Bloodwood and Maple. 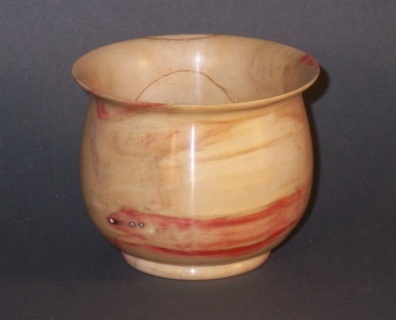 Color: Colors rely on the natural colors of the 183 wood pieces used to make this bowl. 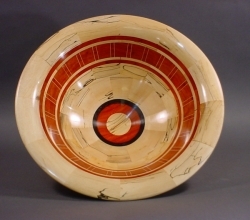 Notes: Segmented Spalted Maple bowl with similar shape as bowls #11 and #13 pictured below. Contact me for more pictures. The bowl is signed and numbered. This piece of art is not intended to be used with food or liquid substances. Color: Colors rely on the natural colors of the 98 wood pieces used to make this bowl. 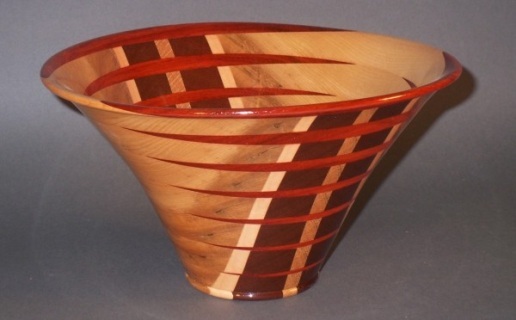 Notes: This laminated bowl features flanking sides of cherry interrupted by intruding spikes of Padauk. Contact me for more pictures. The bowl is signed and numbered. 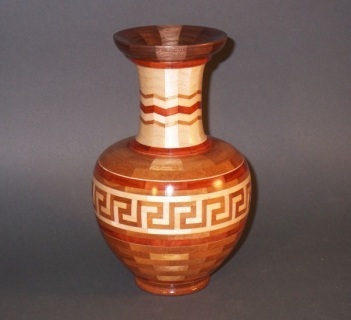 This piece of art is not intended to be used with food or liquid substances. 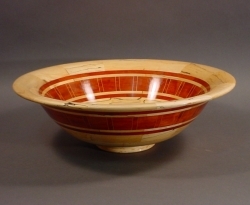 Color: Colors rely on the natural colors of the 193 wood pieces used to make this bowl. Notes: Segmented Maple bowl with feature ring of Mandrone Burl. Contact me for more pictures. The bowl is signed and numbered. This piece of art is not intended to be used with food or liquid substances. 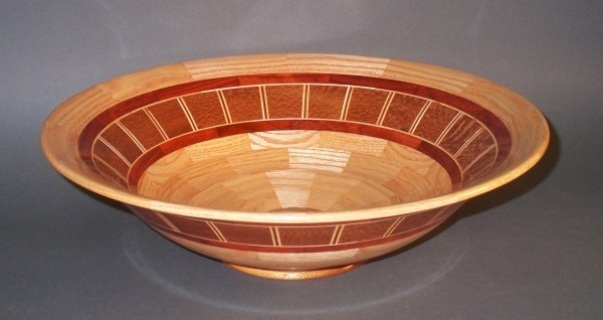 Notes: Segmented Oak bowl with feature ring of Lacewood and Padauk. Contact me for more pictures. The bowl is signed and numbered. This piece of art is not intended to be used with food or liquid substances. Color: Colors rely on the natural colors of the 537 wood pieces used to make this bowl. 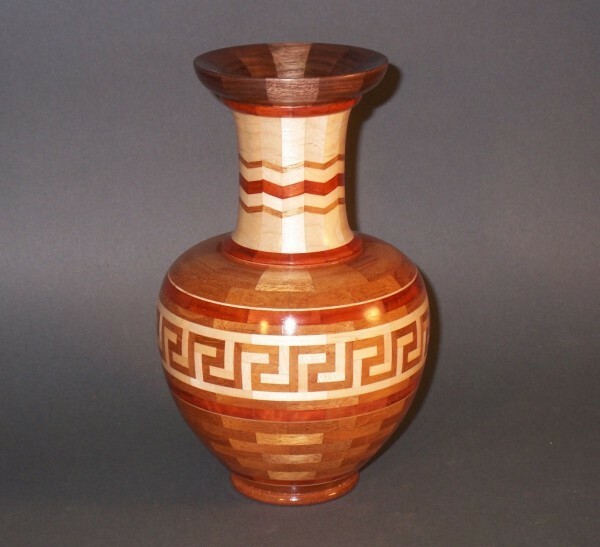 Notes: Segmented Mahogany vessel inspired by Grecian pottery. The feature ring is of Mahogany, Maple, and Padauk while the lip is walnut Contact me for more pictures. The bowl is signed and numbered. This piece of art is not intended to be used with food or liquid substances. 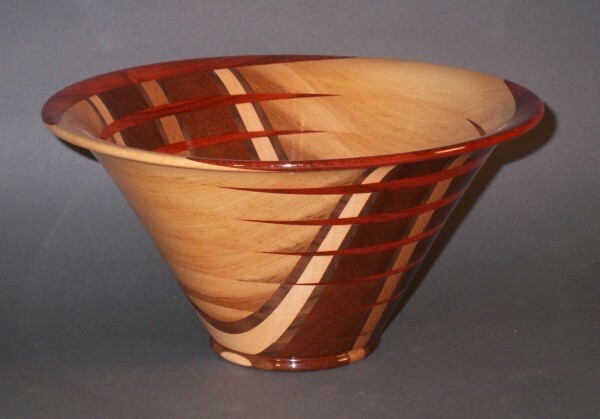 Color: Colors rely on the natural colors of the 105 wood pieces used to make this bowl. 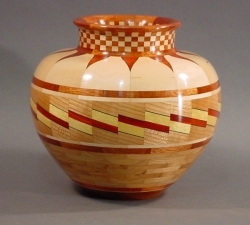 Color: Colors rely on the natural colors of the wood piece used to make this bowl. 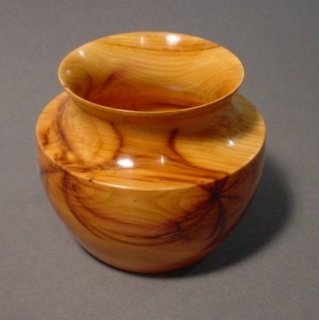 Notes: This small vase is cut from Arborvitae Crotch and was turned to accentuate the unusual grain. Contact me for more pictures. The bowl is signed and numbered. This piece of art is not intended to be used with food or liquid substances. 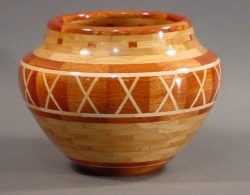 Notes: This small vessel is cut from Ambrosia Box Elder. Contact me for more pictures. The bowl is signed and numbered. This piece of art is not intended to be used with food or liquid substances. Notes: This shallow bowl is cut from Plum and has a pleasing grain as well as bark inclusions. Contact me for more pictures. The bowl is signed and numbered. This piece of art is not intended to be used with food or liquid substances. 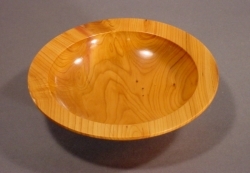 Notes: This small bowl is cut from Cherry Crotch and has an interesting grain. Contact me for more pictures. The bowl is signed and numbered. This piece of art is not intended to be used with food or liquid substances. 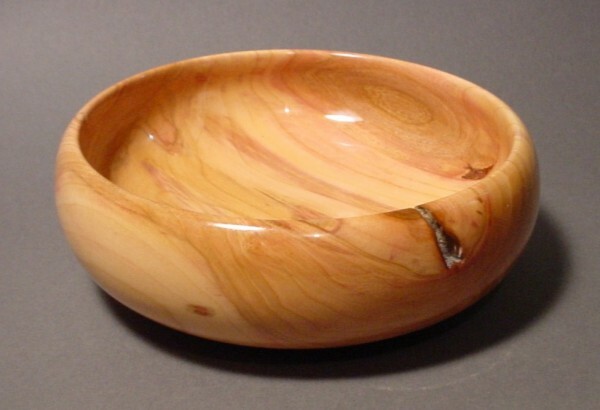 Notes: This beautiful hollow form bowl is cut from spaulted Maple Crotch and turned to show off its best features. Contact me for more pictures. 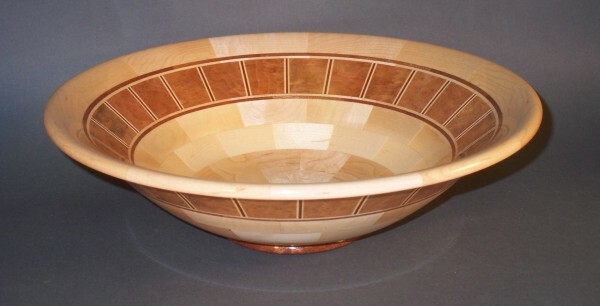 The bowl is signed and numbered. This piece of art is not intended to be used with food or liquid substances.